Klayman: Lebron's Anti-Semitism Won't Bother the Self-Hating Jewish Left in Hollywood! 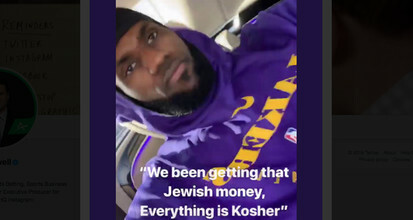 Los Angeles Lakers superstar Lebron James landed himself in a second racially-charged controversy this weekend after posting rap lyrics about "Jewish money." James posted a selfie on what appears to be either Snapchat or Instagram on Saturday featuring lyrics from rapper 21 Savage's "asmr" which references keeping "kosher" and "getting that Jewish money." Sports reporters and conservative critics pounced on the social media post just days after the NBA superstar stirred controversy by saying the "old white men" NFL team owners embrace a "slave mentality" to keep control of their players. 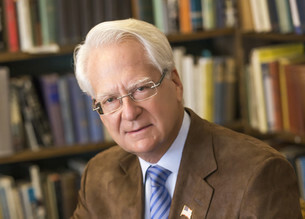 Joel Gilbert and Larry Klayman discuss the large differences between conservative and leftist Jews. Larry reveals a new group of Jewish people dedicated to standing with Israel, Trump, and America. Let me get one thing clear up front. I am a proud Jew and Zionist! Jesus spoke to me on three occasions when I was very down and out and going through a very difficult period in my life, so I also became a proud Christian. That's why I call myself a Jewish Christian. Thus, from my spiritual perspective and worldview, Jews and Christians are blood brothers. Jesus, whether one believes that he was the Son of God or not, was a rabbi and thus a Jew through and through. He did not have an anti-Semitic bone in his heavenly body. The "Jewish Left" Is a Danger to Jewry and Israel! Let me get one thing clear up front. I am a proud Jew and Zionist! Jesus, having come and spoken to me on three occasions when I was very down and out and going through a very difficult period in my life, I also became a proud Christian. That's why I call myself a Jewish Christian. Indeed, a good friend of mine, the very talented gospel singer Marty Goetz, who also is a Jewish "Believer," wrote the most influential refrain for me in one of his beautiful songs: "Yeshua (meaning Jesus in Hebrew), was the truest Jew there ever was." This sentiment matches my own religious beliefs all the way to the top of Mt. Sinai. The Fatherly gospel teachings of this Jewish rabbi who died on the cross a day after his attendance with fellow rabbis at a Jewish Seder on the first night of Passover (aka the Last Supper) was preached after his crucifixion by his Jewish disciples. This is what furthered the rise of Christianity. Thus, in my spiritual and world view, Jews and Christians are blood brothers. Jesus, whether one believes that he was the Son of God or not, was a Jew through and through. He did not have an anti-Semitic bone in his heavenly body. But there are those throughout history that sought to divide the two peoples and also persecute them, and perhaps some of the worst offenders are some prominent Jews themselves. Who am I talking about? I am talking about many in the so-called "Jewish Left." Let's begin with Karl Marx, move to Leon Trotsky under Soviet communist anti-Semitic regimes, and then go to modern day self-hating Jews like George Soros and some of his followers in Congress and elsewhere throughout the nation and the world. In recent days, the leftist media has exploited conservative criticism of George Soros as a foil to allege that we are stoking anti-Semitism in the lead-up and wake of the terrible murder of 11 Jews in a Pittsburgh synagogue. This is a perversion of history, for it is not generally conservatives who are anti-Semitic, but Soros himself. It is not in dispute, that to save their own skin, under the "tutelage" of his father, "Little Leftist George" collaborated with the Nazis during World War II to confiscate the property of fellow Jews headed for Hitler's gas chambers and ovens. Since then Soros has not done anything discernable to even apologize for this heinous act. I for one, would have rather gone to my own death in a Nazi concentration camp than sell out my fellow Jews. But let's move on at this point as well. Fast forward to the aftermath of the Pittsburgh synagogue massacre. Leftist Jews such as Democrat Congressman Adam Schiff, CNN host Jake Tapper at the obvious direction of CNN head Jeff Zucker, and billionaire and fellow Soros Democrat financier Tom Steyer (whose father was Jewish) wasted no time going on the airwaves to attack President Trump, incredibly blaming him for the massacre and suggesting that he is an anti-Semite, not to mention the cause of attempted bombings last week of leftist Democrats. This shameless political ploy intended to influence voters in the lead-up to the mid-term elections next week, leveled in the wake of the deadliest attack on Jews in our nation's history, was "one upped" by the likes of leftist Jewish writer Dana Millbank of the anti-Trump Washington Post, who wasted no time, while bodies were still being processed in morgues, penning an opinion piece titled "Trump's America is Not A Safe Place for Jews," The Washington Post, October 29, 2018. "George Washington, in his 1790 letter to Touro Synagogue in Newport, R.I., told Jews they would be safe in the new Nation." "Now President Trump has violated Washington's compact. He has given sanction to bigotry and assistance to persecution. After the shooting in Pittsburgh, which the (leftist) Anti-Defamation League believes is the deadliest anti-Semitic attack in U.S. history, there is no longer safety under the vine and fig tree." I urge you to read the rest of this unhinged column to fully understand how leftist Jews are cynically using this terrible attack against their own people to further their leftist agenda to ultimately have President Trump removed from office. But if truth be told by us other non-leftist Jews — the ones who truly are in sync with the Jewish masses here and in Israel — President Trump has proven in just two short years in office to be the biggest friend of Jewry there ever was in the White House. Not only has he finally made good on the heretofore unfulfilled pledge of prior presidents, including a truly anti-Semitic one Barack Hussein Obama, to move the American Embassy from Tel Aviv to the Jewish state's capital Jerusalem, but he and his Jewish son in law and daughter have tried to further real peace in the Middle East, for the benefit of Jews, opposing Iran and other terrorist states and interests which want to destroy Israel. He has also rightly opposed radical Muslim immigration into the United States, issuing executive orders for better screening of terrorist implants. I could go on and on. To the contrary, the Jewish Left in this country has generally tried to thwart all of the president's pro-Jewish and pro-Israel initiatives. The leftist and partisan Anti-Defamation League even sided with radical terrorist-connected Muslim groups, such as the Council for American-Islamic Relations, to oppose The Donald's immigration efforts to weed Muslim terrorists out of our broken entry system. Fortunately, rubber-stamped by leftist judges in the lower federal courts mostly in San Francisco and Hawaii, the Jewish Left's efforts hit a brick at the Supreme Court. And here is the rub. Evil Neo-Nazis like the murderer of 11 Jews at the Pittsburgh synagogue, in racist rants on social media, in effect pointed to leftist Jews furthering the immigration of Muslims into the country. This domestic terrorist in effect justified this unjustified heinous massacre as a reaction for the Jewish Left aiding and abetting the influx of Muslims into the United States. While Jews, including yours truly are not against the ban of all Muslims from our shores, it is ironic that many in the Jewish Left will vilify President Trump as the cause of the Pittsburgh tragedy, but not look into the mirror and recognize that their reflexively anti-Trump actions, however wrongly, may have provoked this Neo-Nazi maniac to kill 11 of our fellow Jews. The bottom line is this! The Jewish Left, particularly in this country, is not representative of the overwhelming majority of Jews here, in Israel and worldwide. But regrettably, they are giving professed sick cause to lunatics like the Pittsburgh shooter to work their evil. So it's time for the Jewish Left to stop blaming the most pro-Jewish and pro-Israel president in our nation's modern history, and look inward for some of the reasons for the rise in anti-Semitism. I, as a proud Jew and a Christian, can no longer stomach the hypocrisy and destructive actions of the Jewish Left toward our own people. And for this reason, and to combat the Jewish Left, I am today forming Freedom Watch's "Coalition of the Jewish Right," which I urge all like-minded Jews and fellow Christians to join to combat the Jewish Left. 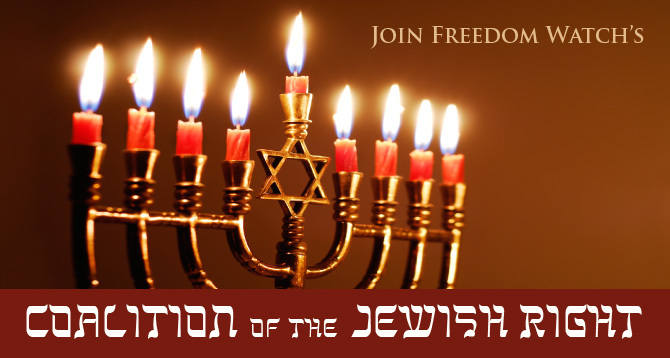 Go to www.jewishright.org to join. And, in today's world only a Jew can form such a coalition, lest one also be falsely branded, like our great president, an anti-Semite by the Jewish Left! A Project of Freedom Watch, Inc.
Americans and Israelis in particular are being ill served and in fact harmed by what is commonly known as "the Jewish Left." Comprised of Jews who are more akin to their predecessors Karl Marx, Leon Trotsky and others throughout history who have been self-hating, their words and actions present a real danger for Jewry in general and the Jewish state of Israel. Now it is time for the great majority of Jews and their allies in the Christian community to push back. The current Jewish Left, which viscerally hates and is doing all it can to destroy the presidency of Donald J. Trump, who is the greatest friend of Israel by any American president in history, needs to be opposed and defeated. Prominent among the Jewish Left are such self-hating Jews such as George Soros, who with his father confiscated the property of fellow Jews going to their death in Nazi ovens and gas chambers during World War II. Soros, and others like him including many "prominent" leftist Jews in Hollywood, largely finance the actions of such vigilante and/or hate groups such as Black Lives Matter, Antifa, People for the American Way, the Southern Poverty Law Center, the Council for American Islamic Relations among many others who are trying to bring down the vision of the "founding fathers" in the United States and Israel. They want to install in the United States and Israel a socialist, secular or atheist, anti-Judeo-Christian, pro-Palestinian/Muslim friendly body politic. In addition, the mainstream media, largely run by the Jewish Left, including the New York Times, CNN and NBC, as well as the social media companies such as Facebook in the United States, and such publications as El Haaretz in Israel are a real and dangerous destructive force to be reckoned with and opposed. In the words of President Trump, they are the "enemy of the people." If taken to the extreme, the Jewish Left, if "left" unchecked and unchallenged, will succeed in installing in the United States and Israel a leftist governance similar to what was experienced in communist countries such as the former Soviet Union and still to this day in Cuba and Venezuela. What is making matters worse, there is a great rise in anti-Semitism in the United States. While there are insidious historic roots for this, anti-Semitism is also being furthered by the destructive actions of the Jewish Left. In this regard, many non-Jews unfairly and unjustly blame all Jews for their actions. Indeed, the recent Neo-Nazi who horrifically murdered eleven Jews in a Pittsburgh synagogue, unjustly blamed all Jews for supporting an uncontrolled influx of Muslims into the United States by opposing President Trump's screening of radical terrorists from predominant Islamic states. The same is true in Israel, where the Jewish Left has furthered the uncontrolled influx of Muslims from such countries as Eritrea and the Sudan and other nations in Northern Africa under the false premise of humanitarian interests. But given the huge cultural differences between Jews and these African Muslims, this uncontrolled immigration into quarters such as South Tel Aviv has resulted in numerous rapes, murders, thefts and other crimes which are literally terrorizing the Jewish residents. Regrettably, incorrectly perceived mainstream so called Jewish organizations such as the Anti-Defamation League, closely aligned with the Democrat Party, which has turned radical left, have actually teamed up with terrorist connected Muslim groups, such as the Council for American Islamic Relations ("CAIR") to further uncontrolled immigration from predominantly Muslim nations. The same is true in Israel, where leftist Jewish NGOs are siding with the Arab population bent on bringing down the ruling coalition of Prime Minister Benjamin Netanyahu, which opposed an influx of more Muslims into Israel. This Muslim immigration will as its end destroy the character and fabric of the Jewish state, which is also the home of Christianity. A reason for uncontrolled immigration into United States; the influx of foreigners, including Muslims hostile to Israel in particular, in part will ultimately increase friendly voter rolls for the Democrats, whose leftist Jewish leaders comprise the likes of Senate Minority Leader Chuck Schumer and Senators Bernie Sanders, Diane Feinstein and Richard Blumenthal. Radical Jewish leftists in the House of Representatives include Congressmen Adam Schiff, Jerald Nadler, Debbie Wasserman Schultz and Barney Frank, and scores of others. They are also opposed to security at the borders of the United States and Israel. This has ironically also increased anti-Semitism, as part of an anti-Jewish backlash fueled by their prominence in the media and on television. In short, not just the political winds of socialism, radical feminism, radical black separatism, and pro-Islamic ideologies and movements been furthered by the Jewish Left, but it is also responsible in part for the great rise in anti-Semitism in recent years. For these reasons, the Coalition of the Jewish Right, which seeks to represent the majority of Jews in the United States, Israel and the world must do all that we can, peacefully and legally, to take down the highly destructive Jewish Left, before they destroy the fabric of society and alter irreparably the body politic of our two nations. Please join our cause by signing up below and help us fight the Jewish Left! Please complete the following form to join our coalition. Please support this cause with your most generous contribution! Call 844-FWETHIC or donate online using PayPal below. The Coalition of the Jewish Right is sponsored by Freedom Watch, Inc.